In 2004 I met Chris Smith who is a friend of the owner of the 1968 GTO soon-to-be featured elsewhere on these pages. After seeing my webpages, he sent me some emails with some stories about his experiences with a 1967 GTO Ram Air he purchased new in 1967. He raced the car for a couple of years in the Connecticut area then sold it in 1969 to buy a 1969 Chevrolet Camaro Z-28. .....I shed tears every time I think about today's market value of that Ram Air GTO. I recall checking production numbers once, and I think that there were approximately 500 Ram Air GTO's with manual transmissions in '67. They came standard with 4:33 to 1 rear ends, and 4:56 to 1 was the only option. Mine was ordered by someone else, and then cancelled before it came into the dealership. The dealer was having trouble selling it. The salesman told me that most customers thought something was wrong with the car because it idled so roughly. The options ordered were kind of weird. It was a two-door hardtop, with the Ram Air performance option, the M-21 Muncie 4-speed, capacitive discharge ignition (that was new that year, along with the 400" motor), a console, gauges (but not a hood tach). an AM push-button radio and little else. It came with a tighter than normal steering box and good handling suspension, but no special brakes were ordered. The color was dark blue, and the interior was black vinyl. It didn't have a vinyl roof or anything. It had the red wall tires, but no optional wheels or even optional wheel covers were ordered. It sort of looked like a poor man's GTO with its small hubcaps, and no whitewall tires. Of course, if a GTO can look like a "sleeper", that one did, and I enjoyed that aspect of its appearance. There were more than a few unpleasantly surprised owners of Vettes, Olds 442's, SS396 Chevelles, and 440" Dodge & Plymouth equipped cars. I particularly enjoyed blowing the doors off of muscle cars whose owners opted to add aftermarket aluminum or chrome wheels, which we just called "mag wheels". Throughout my first season of racing the GTO, I gradually installed six cylinder Tempest front springs, 90-10 front shocks, and balljoint spacers, all for weight transfer purposes. At the rear, I added heavy duty shocks and clamped helper springs over them, with the right helper spring tightened much more than the left, to offset torque until the tires drew a pair of even length black lines upon launching the car. I also replaced all of the rubber bushing in the upper and lower rear control arms with bronze, which I got from Royal Pontiac in Michigan. That made the ride pretty stiff on the street, but it also made the rear tires hook up real well. With this combination, and the rear tire set-up mentioned above, the car used to leave the starting line jumping up into the air in a raised attitude, carrying the left front wheel about an inch or so off of the ground for about the first 6 feet, or so. Of course, it took quite me quite a while to dial in that optimum launch combination. I never did much to the engine, because NHRA rules didn't allow me to (nor did my budget). I installed a set of Balenger headers (which required me to modify my clutch linkage, shorten A-arm suspension adjustment studs and relocate a brake line junction box, which also meant fabricating a couple of new brake lines). By the way, the single most noticeable gain in horsepower and performance (0.5 seconds ET) came from adding headers. 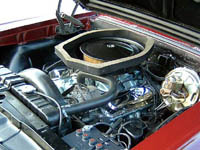 Pontiacs need to breathe to produce power, and the stock exhaust systems were awful, even with the special cast exhaust manifolds made only for Ram Air motors. Make sure that you plan to install an exhaust system similar to Paul's (Doug's Headers with Pypes crossover dual exhaust) in your GTO, because it will make a world of performance difference while maybe even improving gas mileage. I reworked the curve in the distributor (weights & springs), eliminating the vacuum advance feature, and I reworked the Quadrajet carburetor (larger jets at the primary side and smaller diameter metering rods at the secondary side, along with raising the bottom of the metering rods slightly). There might have been a couple of other details with the carb which I can't seem to remember now. The heads came off to get "cc'd", which I had done at Jorgensen's Auto Machine in South Windsor (don't know if that place even exists anymore). I used the thinnest set of head gaskets allowed. This combination, once I got it all "tuned" to work together, was what yielded the 12.7 ET. I never went into the bottom end of the motor, where balancing and clearancing along with using a legal "blueprinted" stock Ram Air cam probably would have yielded the balance of ET improvement required to reach the national record time of 12.4. But, I just didn't have the money back then. Besides, I was already the "B-Stock" king in Colchester (CT Dragway). I just couldn't compete for the weekly stock eliminator title, because there were a couple of cars which regularly ran at or below their respective ET national records. Did I mention what car replaced the GTO? In 1969, I sold the GTO to someone also interested in drag racing, and I replaced it with a much more streetable but equally valuable 1969 Z/28 Camaro. I wanted to dabble in road racing and autocross events. I only kept that car for two years, too. Boy, I'd love to have either of those two muscle cars now, or both of them, for that matter.